A long, long time ago I acquired a full set of Holz & Stein ebony dpns. 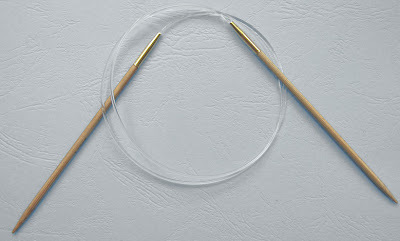 With the advent of flexible, pointy circulars, I have zero use for dpns, no matter how lovely. 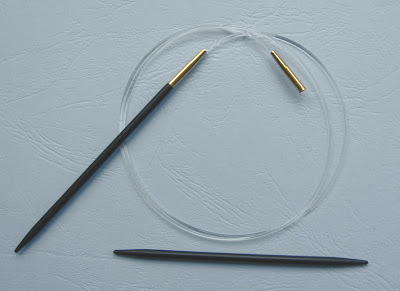 These needles are really beautiful--smooth and richly dark--and I have both 4" and 7" sets. The other day I was rummaging in my stash closet and rediscovered them tucked forlornly inside my needle roll. The little brain cells began crunching possibilities. A bit more rummaging turned up some Clover circulars that I never use. A bit of twisting, a bit of glue...and presto, a handsome ebony circular! I am now wending my way down the third side of the Black Widow Spider King and am on row 71 of Lyra. I haven't been setting my needles on fire lately, as there have been some distracting personal issues taking my attention. Not one to whine about personal problems inside a knitting blog, I do think, however, that everyone can enjoy a laugh at my expense. Last week, our Japanese orthopedist and his wife paid us a four-day visit, which, among other strenuous activities, included a whole lot of cooking. After heaving gigantic, heavy pans filled with gigantic, heavy turkey and spare ribs, in and out of our awkwardly placed ovens, I managed to herniate three cervical disks. There is no doubt in my mind that if I ever find myself cooking for my American orthopedist, the meal will include featherweight dishes such as a single potato chip accompanied by a neatly sliced olive. Low calorie, too! Feminin Strik Comes to the USA! 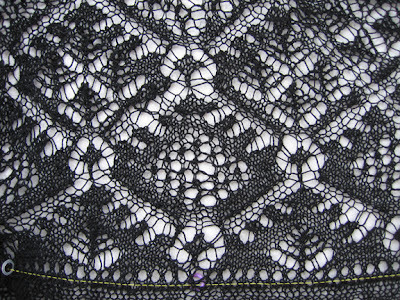 Those who drooled over the Danish masterpiece Feminin Strik, but didn't want to pay the postage, can rejoice in the fact that Debbie Gremlitz of Nordic Fiber Arts will be carrying the book sometime in October. 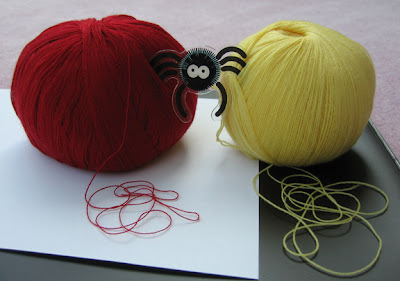 There was also some talk about getting it translated in this Knitty thread. Those who do have the book can participate in a loosely organized KAL for the Circle sweater with me and KnitYoga. Got my yarn, got my needles, and even got my translation! Ready to roll! Alas, bubbly Daphne was so much more interesting than flat Daphne. 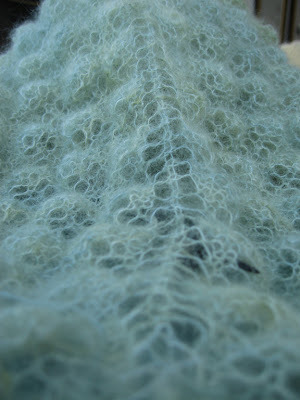 This was, however, one of the most delightful knits I've ever finished. The patterns never lasted long enough to get boring and the ArtYarns silk/mohair, combined with ebony needles, made for continual tactile delight. 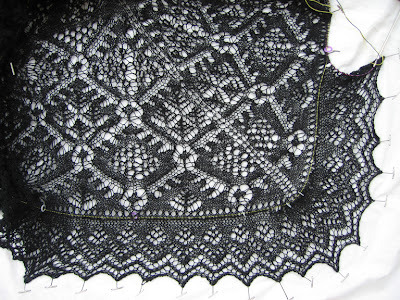 Next up is either Triinu's shawl or one of the Engeln shawls. I haven't made up my mind yet. Actually, the next thing I think I will attempt is some destashing. 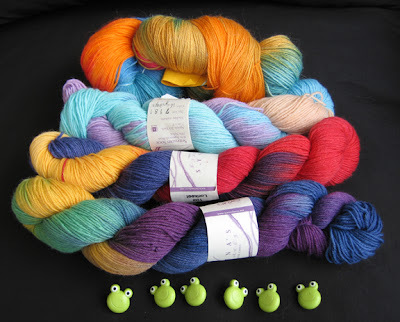 Most of the yarn falls into the What Was I Thinking? category, They are all beautiful, but I know I will never use them for assorted reasons. Ravelry's new server software is shlurping up almost 1000 people a day now--only 3000+ people ahead of me, so it looks like I can join the fun by next week. Cool! I've never knit anything that had multiple personalities before. Moth seems to morph into odd objects while my back is turned. For example, the other day we had a guest who wanted to see my knitting. I fished Moth out of the bar sink (where current projects reside.) "Oh," she said. "I though that was a head of lettuce." Once upon a time there was a coral reef named Daphne. Although she was nicely formed and quite gregarious, no sea creature called Daphne home. She sat sadly on the sand, watching flocks, schools, and pods swim by, nobody even stopping to bubble a quick hello. One day Daphne was sitting quietly in a pool of sunlight, when suddenly, a huge dark shape cast an ominous shadow over the sea bottom, and an thunderous thrumming noise kicked up a bit of current. Daphne rolled a bit to her left--a good thing--because just then, a hail of pointy little sticks came floating down from the overhanging shadow. A few of the pointy objects stuck in her seaweed tresses, though, and no amount of rolling around would dislodge them. "Ridiculous," said Daphne to herself. "I look like a half-bald sea urchin." A minute later, the shadow and the thrum disappeared into the distant sea. The return of the sunlight also brought a pair of octopi into view. 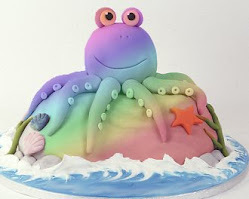 "Hey, Edgar," the red octopus said, "Look at this silly coral reef! She looks like a half-bald sea urchin." Edgar poked at Daphne, snickering a bit. "Hello Gorgeous," he said. "Wanna play ball?" The next thing Daphne knew, she was the main event in a game of reefball. Already feeling sorry for herself, what with being ignored for millennia and more recently, being skewered by boat trash, Daphne started to cry. "Hey," Edgar said gently, "We were just having a bit of fun. Ernie, better put her down before we traumatize all those little polyps." Ernie carefully laid Daphne back on the sand. "What's the matter, darling?" Daphne wiped her eyes with a piece of kelp. "Nobody loves me," she sobbed. "Nobody wants to live with me. Everybody swims by and ignores me. 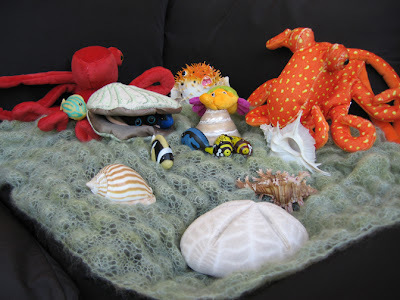 I tried putting out little signs and offering free sea biscuits and the services of a Decorator crab. I hired a publicist. I took out ads in Newsreef magazine. And not a single taker. "Hmm., " mused Ernie. "I think I know what the problem is, dear. I think you are just wound too tight. And I have the perfect solution." Ernie and Edgar removed the pointy objects from Daphne's midsection. "That tickles, " giggled Daphne. She started rolling around the sand in an effort to escape the two octopi. As she did so, Ernie and Edgar notices little trails of thready polyps unwinding from the central reef core. 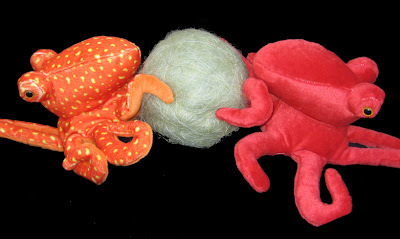 And of course, both octopi immediately thought of Fleegle, their knitting instructor, who had just demonstrated the proper technique for reef knitting a few days before. ...as he picked up the polyp thread and began casting on. 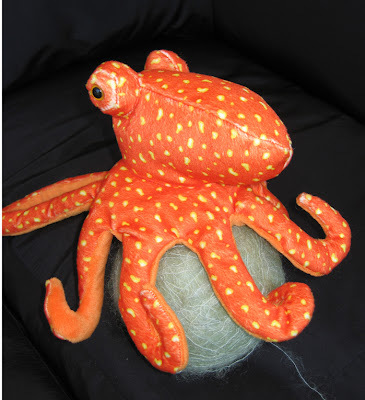 Edgar kept tickling Daphne, Ernie segued into Coral stitch, and pretty soon, Daphne had transformed from an uptight globule into a relaxed, expansive, inviting carpet of coral. "Wow," Daphne exclaimed. "I have never felt so relaxed! Thanks, guys!" Ernie signaled them over. "Looking for cheap real estate, guys?" He gestured towards Daphne, who was now sprawled over a good section of the visible sandy floor. "Yeah," the frillfin goby replied. "We used to swim over there (he finned over his shoulder), but a school of triggerfish moved in and we all started looking like targets." The polka-dot batfish looked particularly depressed during this exchange. His buddies had drifted over to Daphne and were engaged playing hide and seek among her bumps. "Hey look," one of them exclaimed. "Sunken Treasure!" The rest of the group goggled the Neiblings, dropped their clamcases and began unpacking. The next day a couple of trumpetfish moved in, bringing a herd of cowfish to graze upon Daphne's lush bubbleweed. Trumpetfish being rather prone to, um, loudly trumpeting about this and that, quickly spread the word about the luxurious accomodations (Neiblings included! Plenty of algae!). It wasn't long before Daphne became the most popular reef spot in that section of the ocean. And she, Edgar, Ernie, and the rest of the gang lived happily ever after. Well, I have finished writing a new non-Harry fairy tale, but I have to wait for some strong sunshine to take the photos. Maybe tomorrow, if the weather cooperates. 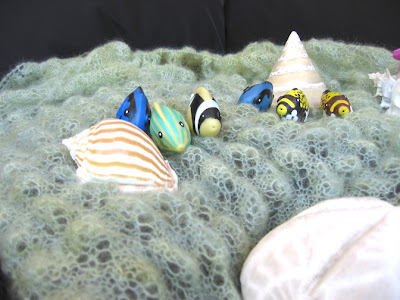 In the meantime, I have a solution to a problem that has plagued me and like-minded footie folks since first the wad of algae crawled out of the primeval slime onto a snowbank and immediately began knitting warm socks for its pseudopodia. The solution turned out to be so simple I whacked myself upside the head. So will you, after you finish reading this post. 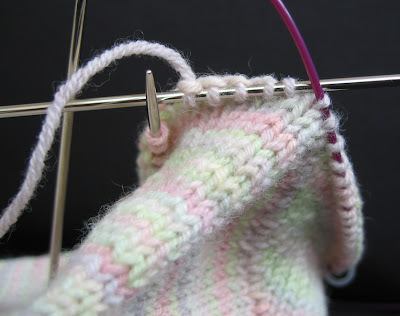 This solution applies to my own Fleegle sock design, (worked on two circulars) but I imagine it can be applied to any heel that is knit back and forth, such as a short-row heel. I don't think the trick, if you can call it that, can be used for flap heels, but perhaps someone might be able to adapt the concept. 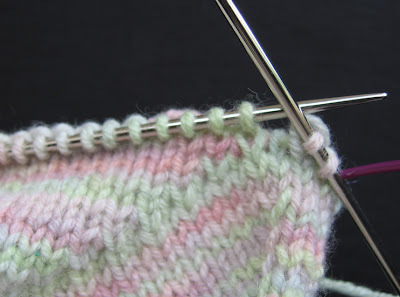 Basically, the reason you get holes when connecting the heel to the instep is because (in the case of the Fleegle sock) the completed heel is one row taller than the instep. So the solution is to omit the final turn for this type of heel. I shall demonstrate. 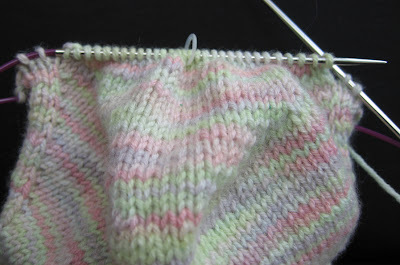 The first row of the heel. Here's a picture of the heel midway through so you can see where this is going. 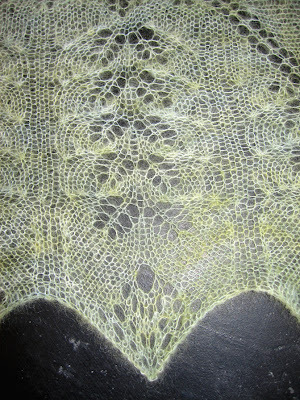 And here's a picture of the almost-completed heel. I have one more row to finish.There are 2 stitches on each side that have not been incorporated into the heel. If, at this point, I knit across the heel needle and do the K2tog, K1, turn, slip 1 thing, well, the heel will be one row taller than the instep, so after I finish the purl side decrease and knit back, hello, there will be a gap waiting to be filled by picking up stitches between the heel and the instep needle. So, instead of turning, I finish the last row of the knit side with K2 together, K1, and then continue on to the instep needle. 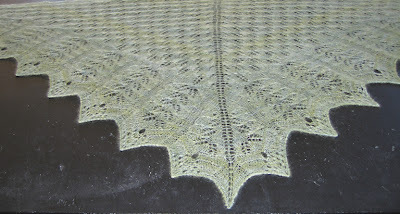 On the right, is the completed heel needle. 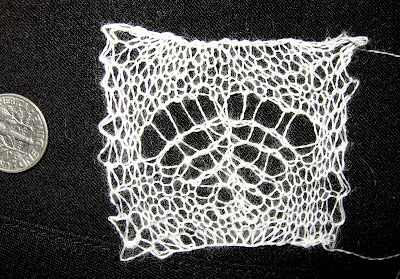 In the center, you can see five stitches of the instep needle worked. 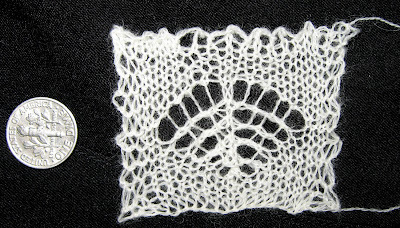 at the beginning of the heel needle. 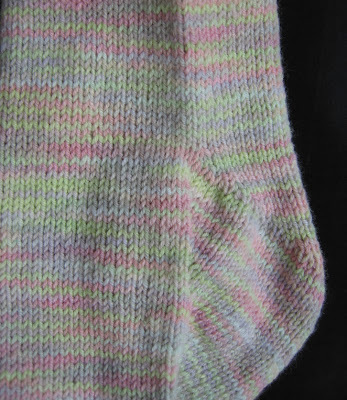 In the case of the Fleegle heel, there are two more stitches on the heel needle than I started with, so I knit across to the end of the heel needle, do a decrease, knit across the instep needle, and do a counterpart decrease at the beginning of the heel needle. And I am now ready to motor onwards to the top of the sock without bringing any holes with me. Here's a picture of the finished heel as we proceed onwards and upwards to the finish line. You can purchase the pattern directly from Sharon for $15. It's a PDF download, so there are no shipping charges. I can't decide if I like it enough to knit it. What do you think? Finally! My package from Yubina showed up yesterday, plastered with gaily colored stamps. Oh my. This stuff is fabulous. 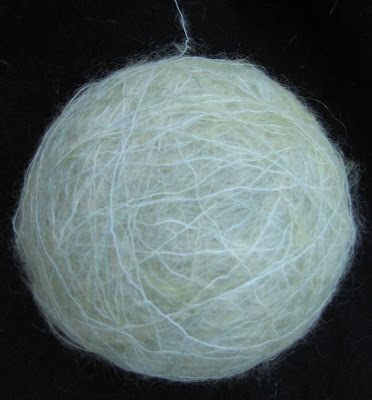 On the left we have a ball of the gossamer cashmere silk and on the right, a ball of the cobweb cashmere. And now, the swatch tests. For comparison, I am including some of the previous swatches. 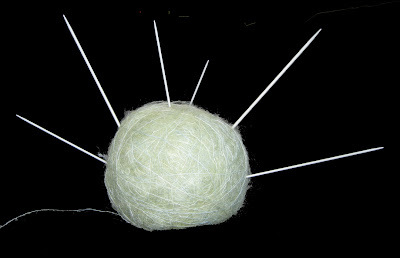 Pros: Lovely to knit, smooth, soft, and wonderful to touch. Blocks beautifully. Cons: Comes in white, white, and white. Pros: Comes in a huge range of colors, but you have to check their eBay store and website frequently if you are looking for a particular shade. Smooth, soft, blocks well. Cons: We had several small spats while casting off. Picking up a dropped stitch was a lost cause. This yarn is virtually perfect. 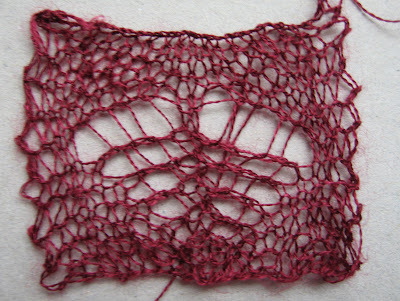 It passed both the knitting-blindfolded test and the dropped stitch test. The droppee hung around while I fished for a crochet hook. It has a wonderful, slightly glossy appearance and is springy enough for my acrobatic decreases. 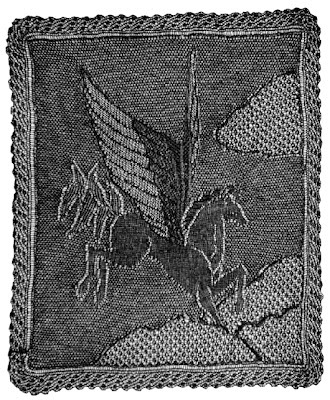 And notice the lovely halo and crisp stitch definition. 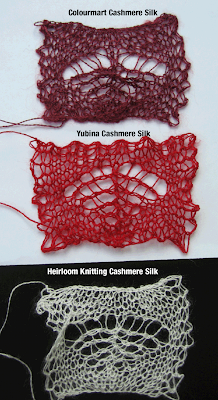 Unlike Colourmart cash/silk, Yubina's is soft and elastic to knit. Although it calculates much heavier than the three samples above, the swatch was about the same size as the others (note the Colormart swatch sort of shrank from it's original blocked size). 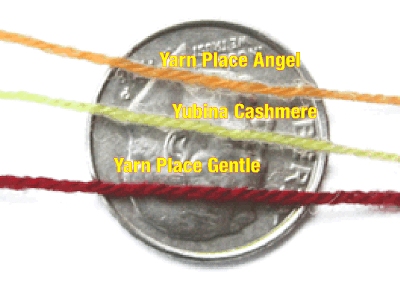 Here's a swatch comparison and a dime photo so you can see how thin the yarn actually is (click the fuzzy thumbnail for a clearer image). 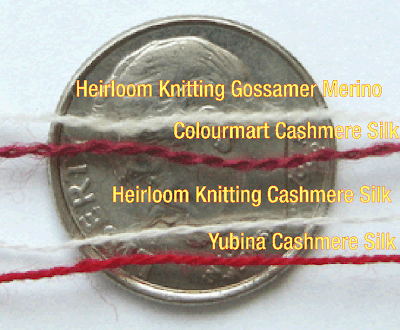 As you can see, the Yubina is thinner and more tightly twisted than the unwashed Colourmart. The Yubina yarn knits up to about the same size swatch with excellent stitch definition and is far pleasanter to handle than Colourmart's yarn. I did a quick-and-dirty wraps per inch with Yubina and washed Colourmart. Yubina comes out at 58 wpi, Colourmart at 60 wpi. This is probably a more precise measure than yards/pound, but this is one case where you need to swatch yourself, I think, to get a good feel for the yarn weight. I can't come up with a single criticism. Cons: Takes four weeks to get the stuff. No free bag of potato chips in the package. Alas, although fabulous, it's way too heavy for Princess. 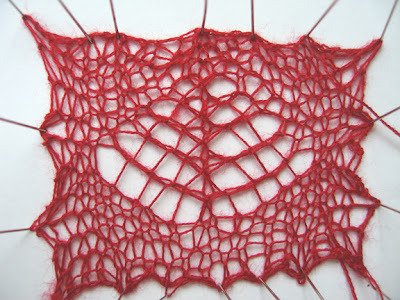 However, it's perfect for any lace requiring a cobweb-weight yarn. 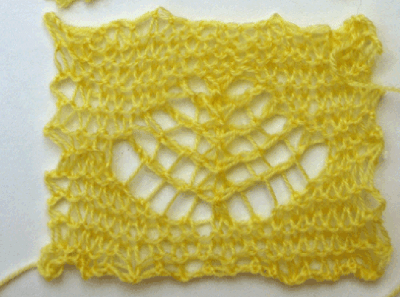 I love knitting with it--it has a rich, creamy feel that's hard to describe, plus the same liveliness that characterizes Angel, Touch, and Gentle from Yarn Place. 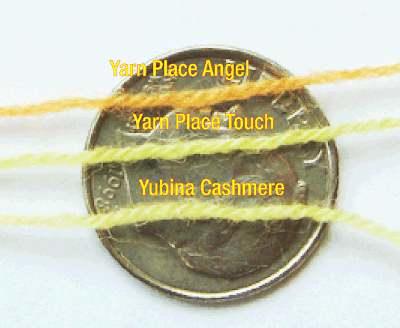 The yarn falls between Yarn Place's Angel and Gentle--a bit thicker than Touch. I first swatched it on size 0 needles, but the yarn just begged for a slightly larger needle size, so the swatch below was knit with a size 1 needle. The yarn has more body than those from Yarn Place--perhaps the cashmere is a bit denser? Pros: Soft as goose down, slightly sproingy, blocks beautifully, available in 40 colors. Cons: Takes 4 weeks to get the stuff. Diamond-studded vegetable peeler is not included. By forcing myself to knit two repeats a day, I have finally turned the first corner of the BWSK. It took me three tries to get a corner I was happy with. By showing these incredible photographs, you all can be happy along with me! 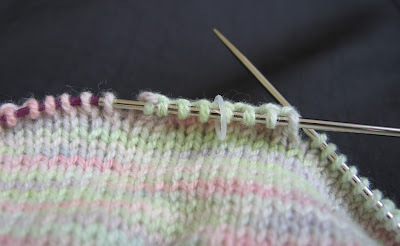 If there is anything more boring than knitting edging, I don't want to know about it. 2.75 sides to go. Urgh. 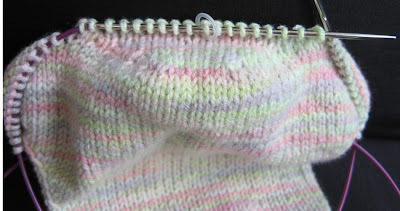 This is a delightful knit and the silly bumps are fun to poke. I assume they will disappear during blocking. If not, then I can enjoy poking them for years. Harry and I have returned from England--Harry as grumpy as always. I don't know why he should be grumpy. After all, he lunched with the Queen several times (the Queen, of course, had no idea there was a giant spider under the table) and spent the rest of the time waving my credit card around any yarn shop he could find. I have to credit the salespeople in these English shops with an extraordinary amount of aplomb. 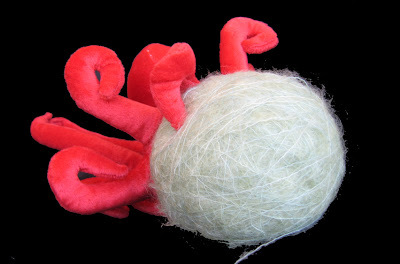 They apparently saw nothing unusual about a furry six-inch spider buying skeins of yarn and cheerfully rang up his purchases. Frankly, this scares me, but he did make lovely choices that fit into our suitcases with some difficulty. 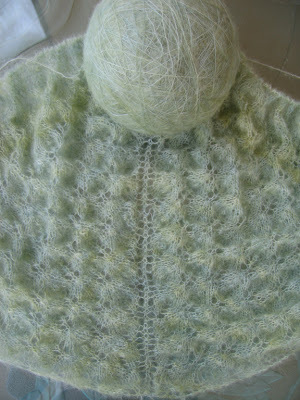 On the top we have a glorious skein of Fyberspate's mohair and on the bottom, three skeins of Fyberspate's silk lace. To our surprise, Harry also bought Roy some yarn for dress socks, complete with frog buttons for decoration. Harry tells me that the silk lace yarn was purchased at I Knit, a petite London shop whose most outstanding feature was the pile of vintage knitting magazines. By vintage, I mean there was actually a mag from 1912 on the shelf. I am not sure when "vintage" shades into "antique," but you get the picture. 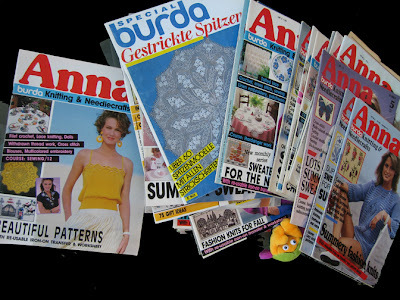 Fortunately, he refrained from bringing home magazines with patterns for woolly undervests, but he did find a few sweet toy booklets with patterns perfect for using up odds and ends. 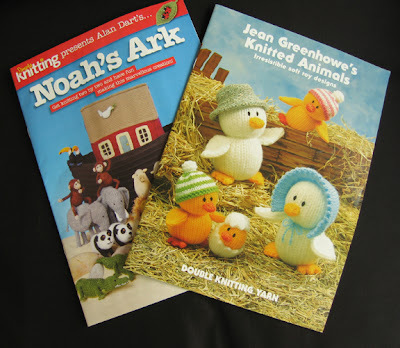 The Noah's Ark pamplet is an insert to the current Simply Knitting magazine, worth getting if you like tiny, adorable knitted animals. Jean Greenhowe has published many booklets, which you can graze through here. 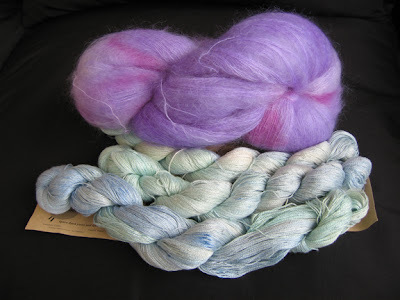 The mohair and sock yarn came from Get Knitted in Brislington (outside of Bristol), a store so full of yarn that it's worth a detour on the way to, say, Chicago. They carry an immense range of goodies, including the entire Fleece Artist, Handmaiden, and Lorna lines. Harry couldn't shlep the camera with him (he hitchhiked and needed all his arms to hang on to the transporting vehicles), so sorry, you'll just have to consult their web page and cry in frustration. Aside from a small amount of clothing and a large amount of yarn, our return luggage bulged with an entire wheel of the Best Cheddar In The Universe, three bottle stoppers, a jar of onion chutney, and a bag of genuine Sherbet Lemons, Dumbledore's (and mine) favorite sweet. 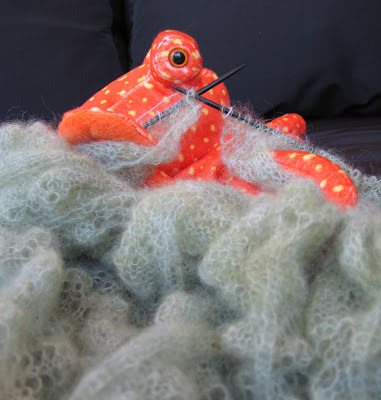 I knit a row of Lyra and four rows of Luna, and turned a corner on the Spider King this morning. It's good to be home.